It makes me cringe to see the prices they charge for a container of hummus at the grocery store. It’s much less expensive to make it yourself, it only takes 10 minutes and it tastes so fresh you won’t want store-bought hummus again. This will keep in the fridge for days but drizzle a little good quality olive oil on top and leave it on the kitchen table with a few toasted pita wedges and it won’t make it to the fridge. You can add more garlic if you like or a little chopped hot pepper. Roasted garlic works well too. To really dress it up, top the hummus with some sautéed ground beef or lamb seasoned with a little sumac. Cook the soaked chickpeas in six cups of water for 90 minutes until very tender. Place cooled chickpeas (or rinsed canned peas) in a food processor and add garlic. Pulse until roughly chopped. Add lemon juice, tahini, cumin and water and pulse until smooth. Add more water if the mixture is too thick. Add salt to taste and pulse again. Serve sprinkled with a little sumac or paprika and a good drizzle of quality olive oil. Toast a few pita wedges (350 F oven for 10 minutes or so until crisp) to scoop up the hummus. Enjoy. 2-3 cloves. Thanks for the catch. I’ll fix that. 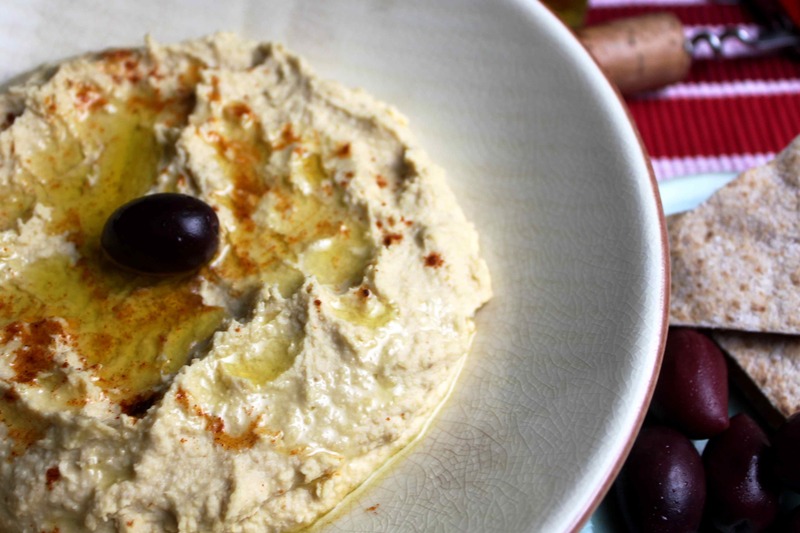 love homemade hummus-far superior to supermarket. Set this out with some tzatziki, baba ghanoush and warm pita and it’s you got a meze platter. Or just dip into it anytime. Great post. Thanks! That sounds like lunch! I just found your blog, and I am really enjoying it. I too am irked by the price of hummus in the grocery stores. Just this past weekend I went camping with two vegans. I did the cooking for the weekend and of course made a huge batch of hummus. I decided to roast the garlic before adding it and it was super yummy. i was worried I’d made too much, but the stuff barely lasted. And I love your addition of the sprinkled sumac. I have some at home and I’m for sure going to try that next time. Thanks. The roasted garlic is a nice addition. I’ve started making double batches and it goes very quickly (even without vegans in the house).